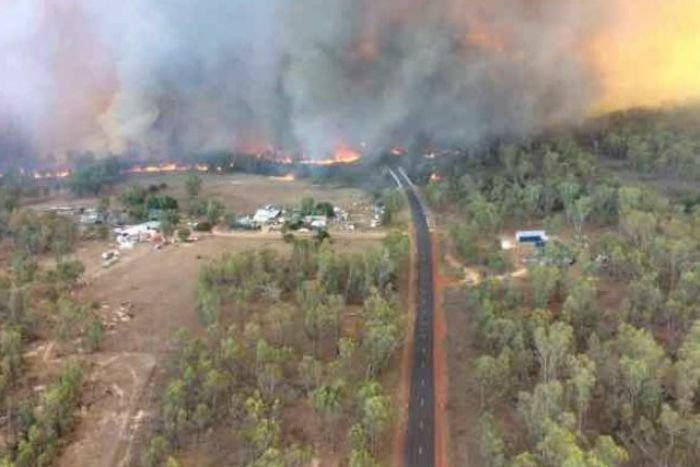 The NSW Rural Fire Service (RFS) has issued an emergency warning for a blaze burning on the Tingha Plateau, in the state’s north west, where flames have crossed roads and are threatening properties. The blaze is spreading quickly and is threatening properties between Lake Copeton and Tingha. Emergency alert warnings are being sent to mobile phones in the area, and the RFS said the fire had the potential to reach Tingha this afternoon. Firefighters and aircraft have been unable to slow the spread of the fire, which is about 160 kilometres north of Tamworth. Additional firefighters are being sent to the area to protect properties. Tingha has a population of around 2,000. There is a statewide total fire ban in NSW today as temperatures soar — the fire danger around Tingha was today rated as “severe” as the mercury rose to 36 degrees Celsius. The RFS has warned people in the area to seek shelter if the fire impacts on their property. Thunderbolts Way and Bundarra Road are now closed. Students from Gilgai Public School are being taken to Inverell State School. "newsunbox.com" is one of the lucrative news, entertainment, politics & business based site. We outfit you with the latest breaking news and accounts as your trusted in accomplice that enhances your understanding.